As a kid, I used to have a hard time explaining my mom’s career. “She’s a home economics consultant,” I’d say. This would often be met with confused looks. 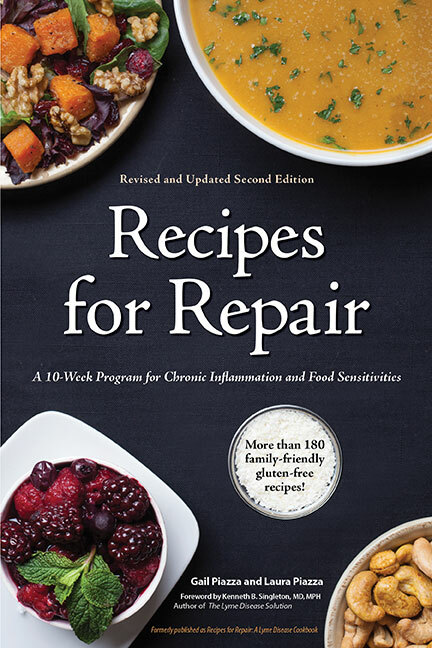 Having the pleasure of working with her to create our book, Recipes for Repair, has really opened my eyes to just how cool and unique her career was and continues to be! When she first started out she mostly styled food for print ads, packaging, commercials and movies. Remember the old Alka-Seltzer commercial, still making the “top 100 commercials of all times” list, featuring the “spicy meatballs”? She made those meatballs!! She also taught Dustin Hoffman how to separate eggs for the movie John and Mary and styled the food in a Maypo commercial featuring then-Mets manager Gil Hodges and pitcher Tom Seaver. More recently Gail Piazza has done food styling for Emerilware, Emeril Lagasse’s product line (see image above). She also develops recipes and tests appliances for an extensive list of high-profile clients, including most recently Dr. Andrew Weil, All-Clad, Tony Little, Lennox, and Krups. Beyond her impressive background though is her raw talent. The recipes in our book fall into several, and often multiple categories – dairy-free, gluten-free, egg-free, Paleo-compliant and vegetarian. Developing recipes this restrictive in nature, in and of itself, would be a challenge for any professional. It was making them taste delicious where her creativity came in. No one should have to eat bland food which is why recipes that didn’t test well with her testers or were just so-so, by her high standards, didn’t make it through the initial testing stages. Rest assured, the recipes on our site and in our book provide you with meals that you can serve without disclaimer. There will also be no need to prepare multiple meals, as the recipes are designed for the whole family to enjoy. Don’t take my word for it, though. Try out some of her wonderful recipes on this site or in our book Recipes for Repair and find out for yourself!